This is a collection of some of the best resources for this time period. Even Advisory members aren't able to cover all of these with every single one of their own students and have to be selective. Feel free to pick and choose from among these suggestions. The best choice may just be the book you already own, and the one from which your student can narrate. (If this looks overwhelming for your student, you might consider plan B - a lightened load for year 8. See it here). I, Pencil by Leonard Read; this short essay is included in ch 15 of Maybury's book. 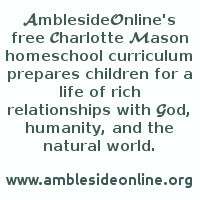 Shakespeare - Continue with AmblesideOnline Rotation. OR, work through Jensen's Grammar ($) in Year 7 or 8. Poetry - a poem by that term's poet, all terms. Work on drawing skills. Illustrate a scene from the week's reading. * Don Quixote by Miguel Cervantes ($) Find an edited version! 12. The New World is Volume 2 of Winston Churchill's 4 volume set, "A History of the English Speaking Peoples." The next two volumes will be used in Years 9 and 10. Don't get the one edited by Henry Steele Commager, as it's abridged. If you can figure out how to use this, this book is online in audio For planning purposes, there is a Table of Contents with dates for all 4 volumes of A History of the English Speaking Peoples, and a schedule to break down the week's chapter into 4 short daily readings. 16. A Relation or Journal of the beginning and proceedings of the English Plantation settled at Plymouth in New England, by certain English Adventurers both Merchants and others is a pdf of journal entries of the original settlers. 28. Foundation for Freedom: A Study of the United States Constitution Workbook by Lars Johnson - The workbook is the text with review exercises after each chapter, which can be skipped. ($) Foundation for Freedom is an updated, full-color version of The Story of the Constitution, Second Edition by Sol Bloom and Lars Johnson ($). Both appear to be the same book/workbook, but the newer one is in color. Sol Bloom's original 1937 Story of the Constitution, which Lars Johnson used as a foundation for his own book, is online at Hathi Trust. Because it was written in 1937, it stops at the 21st Amendment. Lars Johnson did an excellent expanding and updating the Bloom book by adding concerns that weren't on the radar in 1937. He also wrote a chapter on limited government, checks and balances, and Biblical morality as well as a full-page explanation of each Amendment; Sol Bloom's book just explains each one with a sentence or two. If you are in a situation where you need an online resource, the Sol Bloom text could work, but you should also seek out a source that explains why each Amendment was added and what it does. 32. Ourselves: approximately 22 pages per term. This book will continue through all the remaining years of AO/HEO curriculum. This is the 4th volume of Mason's 6 Volume Series. This year: pages 66-135 of Book 1. 38. Francis Bacon essays: Here are some suggested essays to choose from, but feel free to do any (or all!) of them. Of Truth, Of Revenge, Of Adversity, Of Innovations, Of Friendship, Of Regiment of Health, Of Suspicion, Of Discourse, Of Riches, Of Nature in Men, Of Youth and Age, Of Building (first half), Of Studies (paraphrase), Of Praise, Of Honor and Reputation, Of Anger. These selections have been collected and divided into manageable paragraphs here. 40. Charlotte Mason had students at this level read the daily news and keep a calendar of events. We suggest students choose the most important 2 or 3 stories of the week and re-write them in their own words as a chronicle of the year, making the heading of each page something like "This Week in History, September 1st, 2003." Parents: pre-read and filter current events materials (on the web, or in print) as necessary, due to the potential for coverage and topics of an explicit nature, even from conservative sources. We've listed some possible options here. 50. The Holy War by John Bunyan: Charlotte Mason's Kingdom of Mansoul in Ourselves (volume 4 of her series) is based on this book. Mount Calvary Baptist has a helpful study guide, links to study notes, audio files and links to online texts. Ethel Barrett wrote a retelling in 1969; a 1998 reprint can can be purchased at amazon.com here. The a librivox version (here) is read beautifully by Joy Chan. To divide it into 24 readings over a 12-week term, you might listen to one of the 20 audio files twice a week, except for chapters 1, 3 and 4, and 5 which can be divided in half. A text with divisions based on this recording so your student can follow along is here. 56. Grammar: In terms of difficulty (easiest to most challenging), Easy Grammar Plus is probably the easiest, followed by Jensen's, and then Our Mother Tongue. ch 5 (Nitro Compounds) pg 89 refers to the waste products of wine drinkers and "clergyman, or better yet a bishop" to make gunpowder. ch 7 (Phenol) pg 131 suggests gossypol as a potential male chemical birth control method. ch 10 (Wonder Drugs) pg 187 refers to "venereally spread" syphilis. 80. Signs and Seasons - ch 3-5 this year. The book is cheaper from CBD. Field work is an integral part of this book. Field activities are included in the back of the book, so the field guide is not necessary. 92. Charlotte Mason's students were learning three languages at this level. A good English/foreign language dictionary is also recommended.